The workplace is evolving, disruptive innovations are causing new industries to emerge and business models and management practices to change. Advancements in technology and ways of communicating are changing the way we collaborate in the workplace. It remains to be seen what role will automation, artificial intelligence and robotics will play in forming the future of work. Organisations need to be aware of the key trends that will affect them and their employees in order to prepare for them today. We reached out to some of the top influencers on our list to ask them for their views on future of work. We spoke to Cheryl Cran (#1), Jacob Morgan (#2), Alan Lepofsky (#5), Jeremy Scrivens (#6), Josh Bersin (#13), Mike Ettling (#17), Fabienne Neymarck (#19) and Imran Hafeez Panhwar (#20). Be sure to follow them to stay up to date on the best content and resources on crowdfunding. 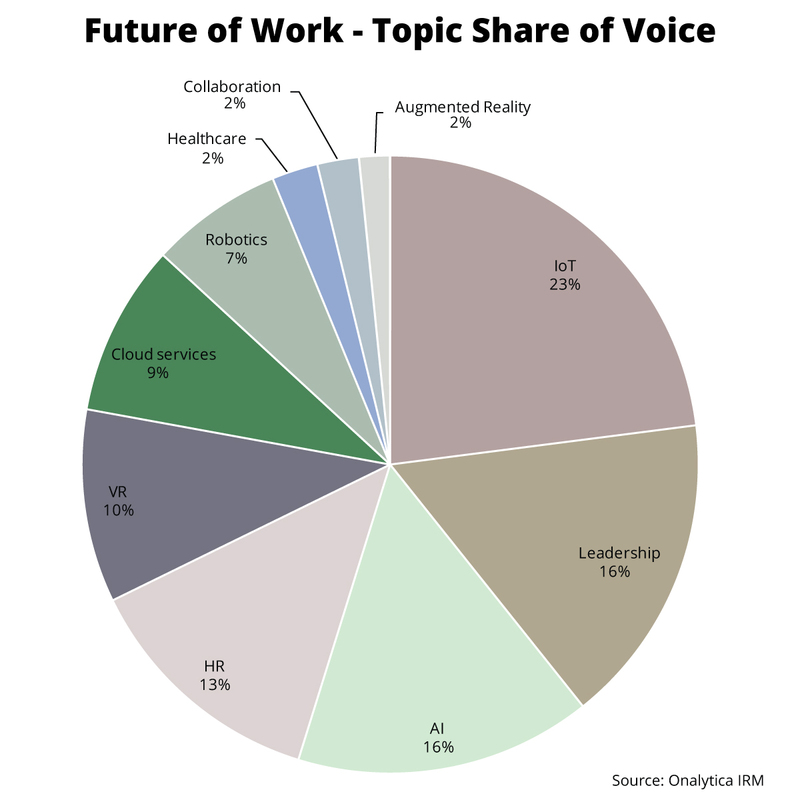 The most popular topic mentioned in tweets and blogs by the top future of work influencers was IoT with a 23% share of voice, illustrating the massive importance of connectivity and networking within the future of work space. Leadership was the 2nd most popular topic with 16% of all topic mentions. The 3rd most popular topic was AI with a 16% share of voice, whilst the topic of HR received a 13% share of voice. VR received a 10% share of mentions, followed by Cloud Services with 9%. The topic of Robotics received 7% of all mentions, followed finally by Healthcare and Collaboration which both received a 2% share of mentions among the top 100 future of work influencers and brands. We were very interested in seeing which brand and individuals were leading the discussion around future of work, so we analysed over 53K tweets mentioning the key words: “Future of Work” OR futureofwork OR FoW from the 1st August – 30th October 2016. We then identified the top 100 most influential brands and individuals leading the discussion on Twitter. What we discovered was a very engaged community, with much discussion between individuals and brands. Below you can see a network map of the online Future of Work conversation with number two individual Jacob Morgan at the centre. This map was created with our Influencer Relationship Management software (IRM). Be sure to click on the map to enjoy the full size network diagram in greater detail. 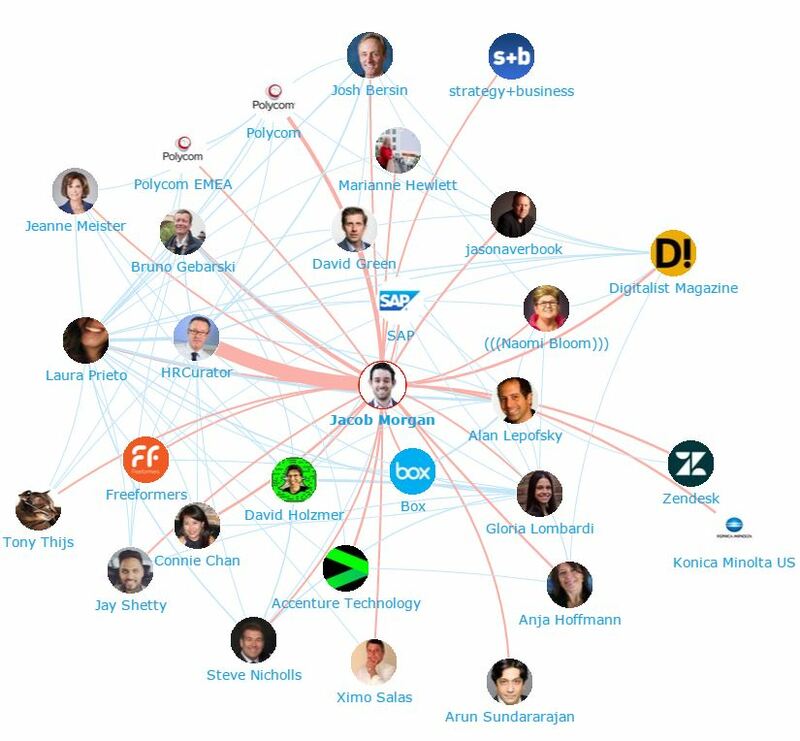 Below you can see another network map created with our Influencer Relationship Management software (IRM) showing the number 1 brand HRCurator at the centre and all the Future of Work conversations to and from the influencers in their field. If you are interested in learning more about identifying, managing and engaging with influencers click here to get in touch! 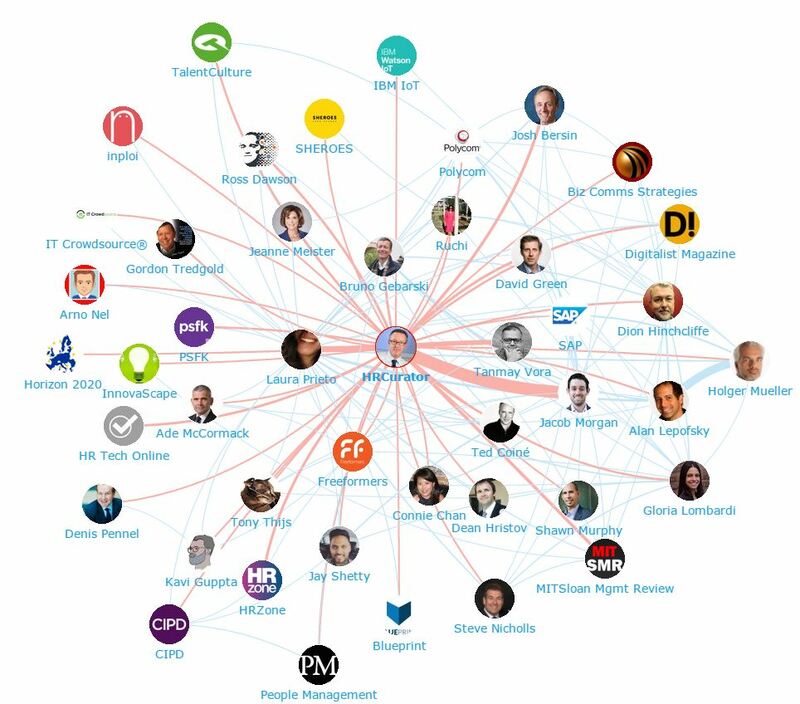 We looked at all the individuals engaging on Twitter to bring you a list of the top influencers in future of work. Below is the top 50, if you want to see who ranks from 50-100 be sure to download the full report by clicking the download button below. We also looked at all the brands engaging on Twitter to bring you a list of the top brands talking about future of work. 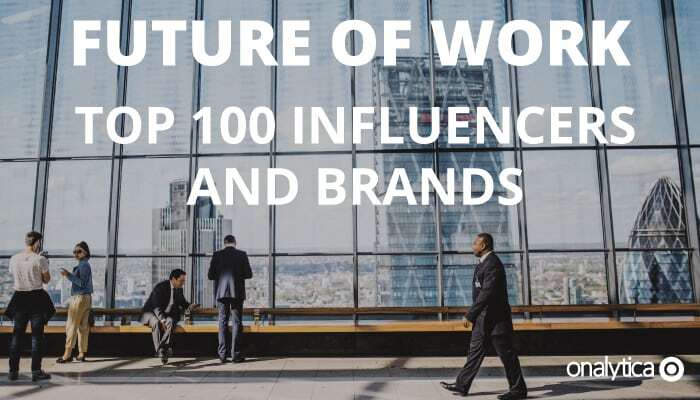 Below is the top 50, if you want to see who ranks from 50-100 be sure to download the report to get the full top 100 list, and see who are most the influential brands in future of work. At Onalytica we love building these lists and want to give back to our loyal readers as much as we can. If you’re interested in other topics (such as Virtual Reality, Digital Health, Digital Marketing) be sure to have a gander on our blog or why not propose some topics to us on twitter? We also build some very cool software to manage all of these influencers. Get a free demo today by clicking the button below! Disclaimer: As ever with these lists, it must be stressed that the ranking is by no means a definitive measurement of influence, as there is no such thing. The brands and individuals listed are undoubtedly influential when it comes to driving discussion around future of work. The PageRank based methodology we use to extract influencers on a particular topic takes into account the number and quality of contextual references that a user receives. These calculations also take into account a user’s relevance (number of tweets on topic) and reach (number of followers). If you want to learn more, please read our article that outlines influencer identification.